Nostalgic for the fifties and sixties? 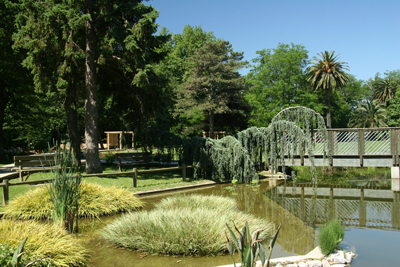 Take a trip to the Botanical Gardens in Saint Cyprien where you’ll meet Vespa and Lambretta scooter fans who will gather together, first at 11 h 30 in the Place Arago on the St. Cyprien road, followed at 17h to 23h by a live 100% groove with a special visit from the Pepper Pots and a new set from the Primaveras. Le Jardin des Plantes des Capellans next to the sports complex on Rue Verdi has a collection of palms and a bambouserie, the star of which is the giant from Japan that, in May, grows up to a metre a day, over a centimetre an hour. There is also a collection of over four hundred roses as well as many local Mediterranean plants through which peacocks strut. It is to the Grand Stade des Capellans that the whole family can go for a summer of sporting and less-sporting-more-artistic entertainment. There are seventeen out door tennis courts, and a further four indoors. There is squash, swimming, body building and fitness gym. There is an ‘ESPACE ZEN’ where sauna and jacuzzi await as well as face, feet and body massage. You can join for an hour, a day, a week, a year and the prices are very reasonable. And whilst you’re relaxing in the spa, children will have a whale of a time at the kids club for a half or full day of fun including rugby, football, circus, archery, painting or dance. Join as a family and all will profit from the wide variety of skills and activities available. Most of the staff are young, enthusiastic and bi-lingual.